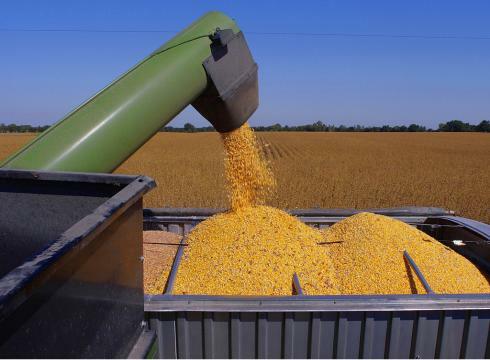 The U.S. Department of Agriculture on Wednesday upwardly revised its outlook for domestic corn supplies by 25 million bushels, more than analysts were expecting, due to weakening export demand. U.S. stockpiles of soybeans and wheat were left unchanged, the government said in its monthly supply and demand report. The market shrugged at the data, however, with Chicago Board of Trade corn <0#C:> and wheat <0#W:> futures remaining firm. Soybean prices <0#S:> turned lower briefly before returning to positive territory. “I think most people were looking for the loss in (corn) exports to offset a gain in ethanol demand, and it looks like USDA went a little more aggressive with their cut in corn exports and a little less aggressive in their ethanol usage” increase, said Jim Gerlach, president of A/C Trading. It is “not even close to being a game-changer though,” he added. Corn ending stocks for the 2015-16 marketing year were pegged at 1.785 billion bushels, up from the government’s November projection of 1.760 billion. Analysts were expecting corn ending stocks of 1.768 billion bushels, based on the average of estimates in a Reuters poll. USDA trimmed its outlook for U.S. corn exports by 50 million bushels to 1.750 billion, but noted increases in export demand for Canadian and Brazilian corn on the world market. A year ago, U.S. corn exports totaled 1.864 billion bushels. The government raised its outlook for U.S. corn use for ethanol to 5.200 billion bushels from 5.175 billion bushels. Soybean ending stocks of 465 million bushels, a nine-year high, were slightly above the average analyst forecast of 462 million bushels. Wheat ending stocks of 911 million bushels were 7 million bushels below market expectations. On the global front, USDA raised its outlook for world ending stocks of wheat above market forecasts, largely due to increased production in Canada and the European Union. World ending stocks of wheat were seen at 229.86 million tonnes, up from 227.30 million tonnes in November and above the range of analysts estimates. The Canadian wheat production outlook was boosted to 27.60 million tonnes from 26.00 million tonnes. Wheat production in the European Union was raised to 157.66 million tonnes from 157.27 million tonnes. USDA pegged global ending stocks of soybeans at 82.58 million tonnes, down from 82.86 million tonnes in November, and global ending stocks of corn at 211.85 million tonnes, down from 211.91 million tonnes.